Enjoy (hopefully) and keep the feedback coming, this isn't a "It's finished so I'll forget about it", more "It's finished, what next?" I've been working on and off (but as my main indie project) a retro platformer with ultra low native resolution (don't worry, it scales up) and a few twists. I'm approaching a point at which it's beginning to resemble something that is actually finished, and at the moment I'm focussing on trying to polish it to a sheen (or at very least, take some of the rust off) before I declare that it's done. As such the more feedback and critism I get at the moment the better! I'm particularly interested in hearing about anything small (or large) that just feels wrong, is confusing etc. Also any ideas for small changes that would improve the game significantly would be very gratefully recieved. All and any general feedback would be fantastic too. You can download a preview (beta I guess) build from http://jwhiting.nfshost.com/coding/jed.zip (2.6MB). It's windows only for the moment I'm afraid, but it should be fairly easy for me to port it to linux (mac too if I ever have access to one), so feel free to bug me about porting if it matters to you. Interesting. Are you supposed to be playing a little floating fetus? Anyway, the game is pretty good. I really like the little karma switches that switch the background and foreground. The jet packs are cool too. The one thing that bugs me about the game is that the controls don't feel very precise. I feel like I'm floating when I hit UP rather than jumping. 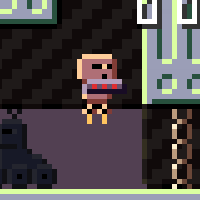 Also, a small bug: I completed a level (level 3 I think) and then a saw blade came by and damaged me! I had an extra life, so I didn't die, but if I hadn't, I wonder whether the game would have said I had died. The problem I found with making such low native resolution game was that high and low travel speeds feel and look really icky. The jumping that's there is the best compromise I could make, I actually quite like the retro feel of it, but it's definitely not to everybodies taste unfortunately. Hmm, intresting, I'll have to look into that one. There's a robot named Jed in a Grandaddy song. Anyway, I really like this quite much. As I was going through the first level, looking at the "background," I instantly knew what the twist would be, and it's pretty cool. I don't mind the floatiness of the controls. Feels like it handles like it should to me. Thankyou, you're very kind, and yep the twist is definitely foreshadowed fairly heavily (in its own way). It's easy to go through most of the levels (I'm in level 9), but not easy to rescue all the robots, so it's well balanced. The controls are just fine for me. The colors and sounds are relaxing. 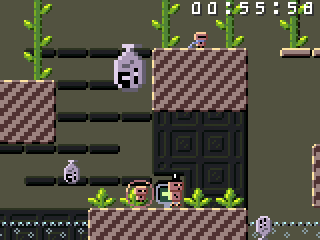 The quick restart of the level is great, it keeps you playing. Secret passages are always a plus. * Get rid of the mouse cursor while on fullscreen. * About jumps : I would check if up is unpressed between two jumps, this made me jump (and die) unwantedly. * In the icy level 6 : if I fall in the water (with a rescued robot) I am sent back to the platform I was before but the inertia due to ice is not set back to 0 and I keep falling again and again in the water till I die. I would reset the speed to 0. An idea with the circle saws : why not add a switch here and there to invert their path, thus giving you the possibility to go somewhere else (find robots in distress). By the way I thought that level 4 was way more difficult than level 5 (with the "boss"). Also I would say thank you very much for a linux version of it. I'm particularly interested in hearing about anything small (or large) that just feels wrong, is confusing etc. Also any ideas for small changes that would improve the game significantly would be very gratefully recieved. All and any general feedback would be fantastic too. Fraid I have to agree with CraigStern (and I hope this doesn't come across as too negative), but the jumping just doesn't seem right to me. There's a constant force pushing you up when you hold jump rather than an acceleration, which really feels at odds with how it should be. Also, I think there's way too much analogue precision with your jump height. You have to hold up for way longer than you should have to to reach your maximum jump, the your minimum jump is far too low to be useful - the result (for me) is that platforming felt cumbersome and akward. Maybe it is just a matter of taste, as you say, but I really think there's a lot of room for improvement there... Maybe it's worth having another look at? Again, just want to say that this is looking really good I really liked the level design and the gameplay twist was really interesting too! Looking forward to the final version! Yes, I rather fear I hit the limitations of my rather primitive pixel art abilities last time I attempted doing some animation on Jed, was very unhappy with the results I achieved. I'm liking what you've done here a lot though, so I guess it has to be worth giving it another go. I always considered this a matter of taste thing, but it's becoming clear that taste is generally against rather than for jump repeat, so it should at very least not repeat by default. Thanks for confirming it. Ooh, that sounds like a bug. I'd better fix that one then. Hmm, yeah, that could be pretty cool. Yes, I'm definitely thinking one of those should be on the cards before I consider it finished. Cool! I really like the foreground/background thing you've got going on there, it's a simple and geniuos mechanic that I can't recall seeing in any other platformer. Cheers, although I'm not convinced it's quite as original as that (heck, even super mario has had world flipping stuff) I have tried to make it more of a strong mechanic than a little quirky add on. Hopefully it's worked. The jump is kind of half and half thing, I kind of wanted a strongly retro feel to the physics (to match everything else), but it's also a result of the very low native resolution (the result of which is 'natural' acceleration can look a bit rubbish). I definitely see where you (and others that have mentioned it) are coming from, and I might even have a bit more of a play and see if I can get anything better out, but in all honesty I doubt it will change. 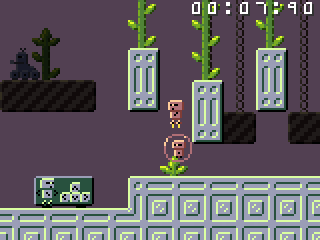 I will definitely note that the style of phyics I've coded here is definitely not what I'd consider to be optimal platformer physics, but they do feel right for this particular game to me. Not at all, negatives are good . As above, I might well have another look at this stuff, especially since it's coming round again and again, but I do think the likelyhood is it'll remain mostly unchanged. It's a significant point. There does seem to be some excellent advice there, but I think I've reached a point at which making changes to the physics would have a major impact on the amount of time I'd have to spend on the game (even minor tweaks would require checking and rechecking all the levels I've got, more major tweaks would require remaking most significantly). This will be no magnum opus whatever I do, so I'm not sure the time outlay would be worth it (especially given I'm not even sure I want to change the feel anyway). ... and thanks to all of you that have commented so far, I've starting to get a decent list of things to fix/think about/work on to make the game better, which is exactly what I'm after. This is invaluable stuff, cheers! I've been wanting to play this since you posted, and I'm glad I did. The level design in particular impressed me. I love the hazards- jumping fish, saw blades, robots. They're all very clean and simple, and you vary the way you use them effectively, which isn't easy to do well. I like the way you used the world switching mechanic. It didn't feel like a gimmick at all, it felt like a healthy, well-nourished part of the design. To me the novelty of a mechanic is worth absolutely nothing. How much it contributes to the game, how well implemented it is, and how well it is integrated into the world are everything. For me, there were a couple hiccups in the difficulty ramp. Level 6 was more difficult for me than 5 or 7, and I found level 9 to be more challenging than level 10. I didn't like level 6 as much as the rest (though it was still good ), but all the rest of the levels were really fun and varied. I second Nanotie's comment about animation. I think a tiny bit of player animation and maybe a simple two frame sequence for the blue robotic enemies would go a long way. I also felt like some of the in-game events could use more feedback attached to them. I would include in this list getting hit, picking up a gun / jetpack, enemies in bubbles timing out, and using a jetpack. None of these were problematic, but I think making these more tactile would improve the feel of the game. The game generally explains itself well. I was only slightly confused a couple of times. I wasn't sure if the jetpack is limited capacity and time limited, or only time limited. I also wasn't sure how falling into water works. I thought it didn't lose me an extra robot a couple of times(? ), but other times I definitely died falling into it- I was a little unsure of what the rules were. But all around things felt very intuitive, and your little signs were unobtrusive but effective. This is a really polished game. Thanks for making it. I found it really inspirational. P.S.- Would you mind if I try using an enemy based on your patrolling sawblades in the game I'm working on? I really like them, and I think they, or a variant, would fit in to what I'm making. That sounds like a fantastic idea, I only hope my spriting abilities are up to it! The jetpack is just time limited, the gun time and capacity limited, but you're correct, it could be much clearer. Maybe a on-item readout would help out there. I'm really glad the signs work, I didn't really want an in your face tutorial, it doesn't really feel necessary, but I wanted to make directions and controls clear to the player if possible. Also, feel free to use sawblade idea, I'm quite sure it's one I poached from someone else (years and years back), and it has fairly regularly reappeared in my own work over the years. It's hardly something original, but it's a concept seems to work really well, and it isn't as cliched as a lot of types of enemy, so it's a nice one to use. Tell me what you think, and use/modify them if you like. I liked the game but ice physics affecting your movement in air has always felt kind of sloppy to me. I can see why you would want to keep it though. Wow, that was all fantastic and inspiring stuff to see. So inspiring in fact that I just spent the last few hours putting some animations in (and fixing up/tweaking other things in relation to some of the other feedback). The ones I've got are more minimalistic than yours (they're 2 frames each), but they still seem to inject some life into the game which is swell. I've uploaded a new version of the game with these animations in at the same place as the last one (http://jwhiting.nfshost.com/coding/jed.zip). * Fixed falling off ice into water and maintaining velocity bug. So nothing ground breaking, but improvements nonetheless. Let me know if you hit 100% complete! I can't say I was entirely happy about the idea of airborne ice physics for this exact reason , but having tried the game both with an without it I can assure you it feels far more wrong without it. In a game with weaker general air control I'd scrap it in a minute, as it is it'll stay. You know what? The jumping wouldn't bother me if you put in little burners that fire up on the bottoms of his feet when he does it. Because then I wouldn't assume that he's jumping: I would assume that he is, in fact, floating with the help of some short-term burners, and then it would feel perfectly natural. Just a thought. You might just be on to something here actually. It never quite sat with me right that a wheeled robot could jump 'normally' in the first place. Just had a little play and I think this could work nicely. Did you mean something like this? It does actually feel a bit more natural to me like this anyway. I suspect I'll need to rustle up a new jump sound though, the current *BOING* doesn't quite fit anymore. Wow, that was all fantastic and inspiring stuff to see (...) The ones I've got are more minimalistic than yours (they're 2 frames each), but they still seem to inject some life into the game which is swell. I thought they worked perfectly with the style of the game : nice job. More animations now would seem too much, so you got it right I think. * Now power up is very clear, nothing to worry about anymore. * Velocity bug tested ok. I don't know if this is a problem but sometimes I fall in the water with quite a few bots but I'm not sent back to any platform, I stay in the water and eventually die. I did spot all the bots now, problem is : I can't bring them all home yet ! By the way, I can say now that the game is itself quite a lesson about level design ! The moment I discovered the hidden part of level 1 was a great feeling ! Also the jetpack+switches associations are amazing ! When you go get the bot in here and go back towards the left, holding up, you end up floating in the air at the top of the screen through half of the level : snapshot1, snapshot2. As soon as I release the up key, I fall down normally. I found that disturbing at first and then It appeared to be very handy to get directly to the jetpack part... so, if it is a bug then I would say keep it in the game ! It never quite sat with me right that a wheeled robot could jump 'normally' in the first place. Just had a little play and I think this could work nicely. Did you mean something like this? I fear that the jetpack won't have as much impact if the robot is already on boosters. only 9 bots left to rescue... come on, come on, come on ! Heh, nicely spotted. It would be easy enough to fix this but I think I'm actually ok with the way it is now, I like the idea that skilled player *can* pull off a instant bunny hop if they want to. Bah, I haven't seen that one in a while, I'd thought I might have caught it entirely but apparently not.. I'll have to see if I can tighten this behavior up any further. Well, that of course is only half of the problem , excellent effort though. EEEeeep, you appear to have stumbled onto a rather major bug with my anti-bunny hopping code that I wasn't aware of. Looks like you can do that *anywhere*, not just on that part of that level just by keeping up held on landing any jump, and then walking off a ledge. Definite priority fix there! I was a little worried about that myself, but having tried it in game I think the two feel sufficently different, even complementary that I'm not so worried any more. I think this may well be a good middle ground, the game keeps the bizarre (but I like it) jump, but it might feel a little less jar-ing to new players. .. and thanks very very much for doing so much thorough testing, very very very much appreciated! I've updated the zip file with a version that has the major bug fixed, a booster style jump, and saves out your music/sound preferences (it's worth noting that if you're loading an old save the game might be silent until you enable the sounds in the menu, new players should be fine). Now time to get some sleep I think! Hey, if anyone hasn't played this yet- download it now! It's nonviolent OCD robot jetpack semi-exploration puzzle platforming at its finest. I'm revisiting the game and trying for 100%. The secrets are consistently rewarding and fair. I've had a lot of great revelatory moments when I finally figured out how to get to a hidden robot. I still haven't managed to get all 5 robots in level 6 without getting hit, though! Eep. The rocket feet animation works well, I think it adds a lot to the game. I never really had any issues with the jump, but hopefully this will make it more intuitive and likeable to those who do. I don't know if this is a problem but sometimes I fall in the water with quite a few bots but I'm not sent back to any platform, I stay in the water and eventually die. I have run into this in the long jetpack section over water in level 3. Your builds are coming out faster than I can play them.